Place pizza stone or pan inside oven and preheat to 500 degrees for 30 minutes. Remove sausage from casing (if you have sausage links) and cut meat into bite-sized pieces. In a skillet brown sausage over medium heat until fully cooked, about 12-15 minutes. Drain on a paper towel lined plate. Set aside. While sausage is browning, in a separate skillet melt one tablespoon of butter on medium heat. Add sliced mushrooms and a ½ teaspoon of salt and cook until soft and all water has evaporated, about 8 minutes. Remove mushrooms from skillet and set aside. Melt 2 tablespoons of butter over medium heat in the same skillet used to sauté the mushrooms. Saute onions, garlic and ½ teaspoon salt until soft, about 10 minutes. Add 2 tablespoons of flour and stir to coat onions and garlic. Turn heat down to low and slowly pour milk into skillet, whisking constantly. Once all the flour has dissolved simmer sauce until pizza sauce consistency, about 5-10 minutes. Add cream cheese, nutmeg, salt, and pepper and stir until cream cheese is fully melted and evenly distributed. Set aside. Roll both pizza doughs out on a cornmeal surface. 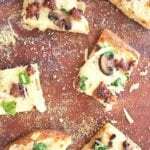 Cover the pizza crusts in a layer of the cream sauce then top evenly with a layer of mozzarella cheese. Top both pizzas evenly with sausage and mushrooms. Transfer pizza to pan or stone and cook until cheese melts and crust turns golden brown, about 10 minutes per pizza. I cooked the pizzas one at a time. If you want to do both together, you’ll probably need to cook the pizzas a little longer. Keep on eye on them. Let cool for 5-10 minutes, sprinkle with parsley and parmesan, cut and serve! *I recommend Naturally Ella's crust recipe. You’ll need a total of about 2 hours to prepare the crust: 30 minutes to make the dough, 60 minutes for the first rise, and 20 minutes for the second rise.